After considering about a dozen of tricycles in India and going over hundreds of reviews by parents online, we think R for Rabbit Tiny Toes Grand ticks all the boxes for the best tricycle in India for kids. Made with good quality materials, Tiny Toes Grand from R for Rabbit is a multipurpose tricycle that offers more benefits than most tricycles with push handle and other extra features. If trike reviews are any indication, it is ideal for 1 year old kids and above, who have yet to start to learn how to pedal on their own and also a decent pick for bigger, grown-up kids as well. How can the same tricycle be a good fit for little kids and grown up kids at the same time? Well, it is a smart trike featuring a grow-with-me design that helps it transition well from one stage to another as your infant grows. For example, the push bar and the 2 point safety harness allow you to use the bike as a stroller for your tiny one. As your kid starts to grow, you can get rid of these extras one by one until your kid becomes completely aware of how to pedal and steer the trike all by themselves. From the little kid mode to the big toddler mode tricycle, the smart trike converts with ease and in a few minutes. This multipurpose design works to its advantage helping it outperform its traditional rivals from LuvLap, Baybee etc. For a lightweight trike, it offers good stability and is quite a joy to use than most of the top 10 trikes in India that we have listed down below. With no canopy for shade, it may not be suitable for outdoor use. Nevertheless, it is made from quality materials, safety certified, easy to steer and maneuver, and less expensive than most trike models in India. That said, it’s certainly not the cheapest out there, but, given it’s versatility and longevity, it’s a great investment. 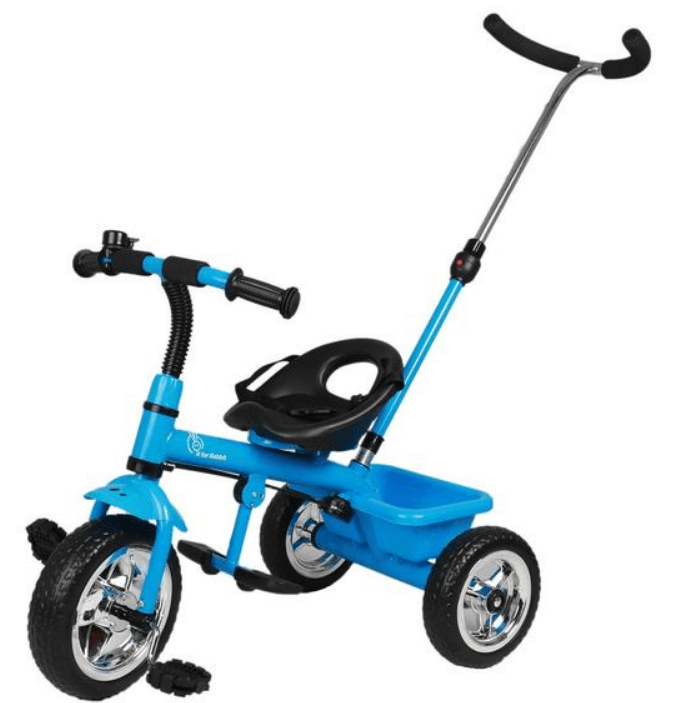 Another good trike to consider from the same brand is the Tiny Toes Grand version. If you looked at Tiny Toes Grand and were disappointed with it not having a good canopy for shade, the R for Rabbit Tiny Toes Sportz has you covered. Nothing short of a highly versatile cycle, The Sportz has the same set of features as the Grand is made with good quality materials, providing more benefits than most baby tricycles in its class. Like The Grand, it is a great option particularly for kids who quite don’t know how to pedal yet, and provides a fun, smooth ride for bigger kids as well. The R for Rabbit trike is nothing like the big tricycle with a giant set of wheels that we know from our childhood. In fact, it is sleek, versatile, and comes with useful features that you’d love to see in any grow-with-me trike. Yes, the trike is a great option for infants as young as 15 months old: it has a long push bar with direction control that lets parents to use it like a stroller, a mini storage compartment on the back right behind the seat, and a well padded comfy seat with 2 point safety harness to keep your kid strapped in and safe. Keeping family requirements in mind, we focused on shortlisting tricycles that we think will get a lot of use over time. There is no point spending 3500/- Rs on a tricycle that can only keep your child occupied for a few months. What if your kid outgrows the tricycle in just a few months? You cannot expect your kid to have fun with a tricycle that is not the right size. That makes it clear; anything a kid cannot quickly outgrow is just about perfect, and this is where a grow-with-me tricycle comes in handy. Unlike normal tricycles, a grow-with-me trike has a special multi-stage design that allows it to be versatile and suit the evolving needs of a kid as it progresses through different developmental stages from infant to toddler. While preparing this guide, we took a close look at both normal tricycle models and grow-with-me trikes as well. But we found out that grow-with-me tricycles in India do a better job at fulfilling the requirements of a modern parent over a longer period of time compared to their classic counterparts. And this is exactly why they feature several times in our list. Make no mistake, traditional tricycles are excellent when it comes to helping kids pick up skills like pedaling and steering. And, they’re a lot of fun too. But they were simply no match for the grow-with-me tricycle models when it boils down to how versatile a bike can be and how much use it can get over a longer time frame- both key factors for determining how valuable a product is. We interviewed physical therapists in Chennai for their opinion, had a lengthy chat with local bicycle companies, surveyed a small sample of parents to know what they expect to see in a good tricycle for a 2 year old, 3 year old and toddlers in India. We also scoured the internet for tricycle reviews to find out the most popular and best selling tricycles in India for different age groups. We ended up with a list of more than dozen tricycles from different brands- both domestic and foreign. Later, we narrowed it down to more than half a dozen tricycle models in India that were highly recommended, carried good reviews and ratings, and boasted most features parents said they would like to see. In short, here is a compilation of different factors that we thought were essential in making a great tricycle for kids. Our survey indicated that parents would ideally want to buy a tricycle that they can keep possession of until it can be handed over to another child. And that rules out all those tricycles made with cheap, inferior materials. For a tricycle to hold up well, it needs to be made from quality materials. The bike shops we consulted with did not give us any pointers on what worked the best in general, but they encouraged us to go for models that look and feel sturdy and everlasting. They also added that tricycles made from materials like aluminum, steel, rubber and plastic stand the test of time and are worth betting your money on. Safety is another factor we didn’t take lightly during our product research. Parents of the littler kids said they preferred to pay a little extra for tricycles that were fitted with safety straps for added safety. The sense of stability is another factor which several parents consider crucial in their choice of a tricycle. Any tricycle with a wider wheelbase than usual offers better grip on all kinds of surfaces and reduces the odds of slipping, thereby providing better stability. The material and build quality of tires was another decisive factor for many parents. Tires made from foam or rubber suit pavements more than plastic tires and are known to ride smoother even on rough surfaces. That explains the popularity of tricycles with rubber tyres. Ease of use, back support, seat comfort, and the overall riding experience make up some of the other things that parents cared for. Some parents were really interested in finding out like how low or high the seat is and whether their kid would find it easy to reach for the pedals etc. Our surveys showed that parents were looking for a versatile tricycle that would evolve with the kid as it grows, progressing from one developmental stages to another. This is definitely one area where a grow-with-me tricycle like the R for Rabbit offers a great advantage to parents. With a push bar driving system, parents can steer and drive their toddler around who is not quite hands-on with pedaling yet. And, as the child grows, the same bike can transition into a big kid tricycle, with all the extras like canopy, push bar stripped. From 1000/- Rs to 7500 /- Rs, there is a lot of tricycles in India to choose from. But it all comes down to one thing:- value for money. Parents said they wouldn’t mind paying extra for tricycles with better quality and more features because they generally tend to last longer and are backed up by a solid warranty cover. The R for Rabbit Tiny Toes Grand is a solid, multi-purpose, easy to use tricycle in India with the ability to provide great stability and safety while keeping your child comfortable. Its ability to hold kids as young as 15 months and carry around big kids speaks volumes of its versatile quality. Yes, it does not come cheaper than most tricycles in India, but it’s a different beast. It offers a lot more value than most- and that includes the possibility of a good three of four years of continuous use as your baby grows into a big toddler. Made of superior materials, it provides great durability and that means it will hold up well over time and you can consider passing it down to another child. Designed to evolve with kids, the Tiny Toes Grand is very different from the traditional tricycle. Its smart 4-in-1 design lets you use it for years with a single kid and that means you need not keep buying one tricycle after another fearing that your kid would outgrow. The special design is made to work for different development stages of the kid, with the first and last being more useful than the rest. 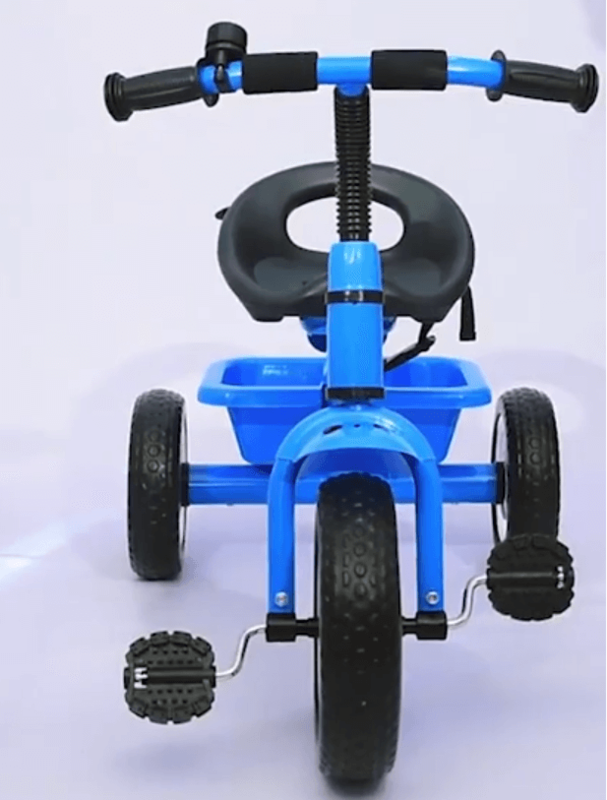 The first stage boasts features like directional push control for parents, a sturdy seat with safety harness, a large canopy for shade, flip down footrests etc whereas the last stage sees the tricycle transform into a plain, bare-minimum tricycle with all the aforementioned extras stripped. The R for Rabbit Grand has a firm push handle connected to the wheels that can both push and steer the tricycle. It is long and comes with a telescopic handle that allows it to be extended by a few extra inches. The plastic seat is totally comfy and comes fitted with a harness. The plastic ring and the 2 point safety harness pushes its safety ratings up a notch as it keeps a baby stay put. When you put your baby in the seat and secure the harness, you can rest assured that it will keep the baby from falling forward due to the momentum or slipping off sideways due to any swerving movement. The foldable/detachable canopy is fairly long with additional panel of cover and that means your baby gets complete protection from the sun. And for the times when you don’t need it to be fully open, you can strap it back to its frame with the help of two mini buckles. Unlike other best selling tricycles available in India, this trike is quick to convert from a parent assisted toddler trike to a completely kid operated trike. Stripping out the push bar doesn’t take more than a few moments although the canopy and seat with the plastic ring around it might take you a little while to remove. All of this can be done without any tools though- which is a plus. The trike gets a plus for its ability to give a nice, effortless and smooth ride. It is easy to start and not that difficult to turn. Larger front wheels made of rubber and metal give it better traction and stability than most toddler tricycles, making the tricycle roll over without any trouble on pavements and rough surfaces where plastic wheels are known to struggle. Like most tricycles, this one, too, has a storage basket in the back, and comes with a cute little bell attached to the handlebars. It weighs about 7 kgs, which is not uncommon of tricycles made with high quality plastic and metal. The trike takes about 10 minutes to set up and the instructions are easy to follow. The maker, R for Rabbit rolls out this tricycle in a variety of colors, and gives you one year warranty on parts only.